Good day to all you Azure Strikers out there! We thought it was the proper time to introduce the final two members of The Seven, but before we do that we wanna bring all you Gunvolters up to speed on what’s going on with Gunvolt right now. With the release of Azure Striker Gunvolt 2 / Azure Striker Gunvolt Striker Pack coming up toward the end of next month on the Nintendo 3DS, we wanted to announce that pre-orders for the Striker Pack are available at Gamestop, Amazon, Best Buy and others in North America! Keep in mind that the release date of the Striker Pack may extend slightly into October by a few days. As for our friends in Europe who are waiting for information about the Striker Pack there, we do not have any announcements of any kind yet, but rest assured that we haven’t forgotten about you. Also, in regards to the Japanese Voice Mode for Azure Striker Gunvolt 1 on the 3DS, we are sorry that it is taking as long as it has to give you any concrete information. At this point, we can tell you that the Japanese Voice Mode will definitely be included in the Striker Pack for sure. Just like the Steam version, it will have all of the voices back in place and the new translation to go along with said voices. As for any sort of patch/update to the digital version of GV1, as soon as we have something for you, we will not hesitate to announce it. Now, without further adieu, it’s time to meet Gibril and Asroc! Greeting Strikers! Coming off the big announcements we had recently about the Azure Striker Gunvolt anime, Shovel Knight appearing in Azure Striker Gunvolt 2, and the Azure Striker Gunvolt: Striker Pack getting a Western release courtesy of Yacht Club Games, there’s a lot of awesome Gunvolt goodness going around right now! 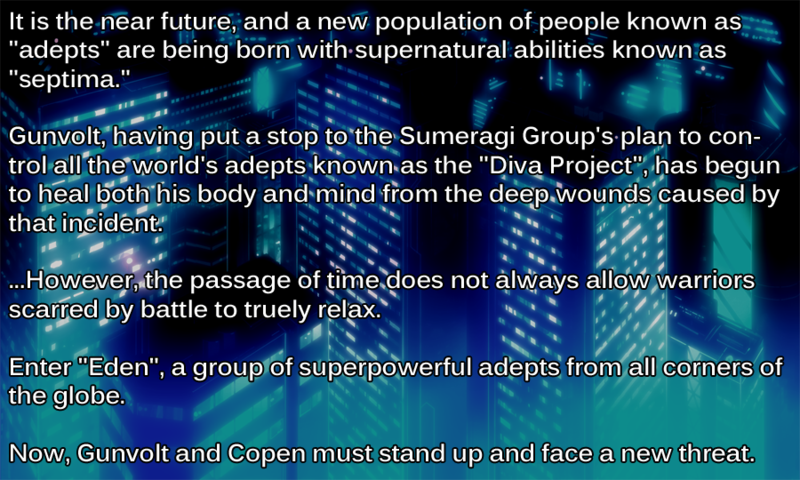 Well, let’s add even more awesomeness to the pile, with three brand new character introductions for three of Eden’s “The Seven.” Meet Tenjian, Desna, and Milas! 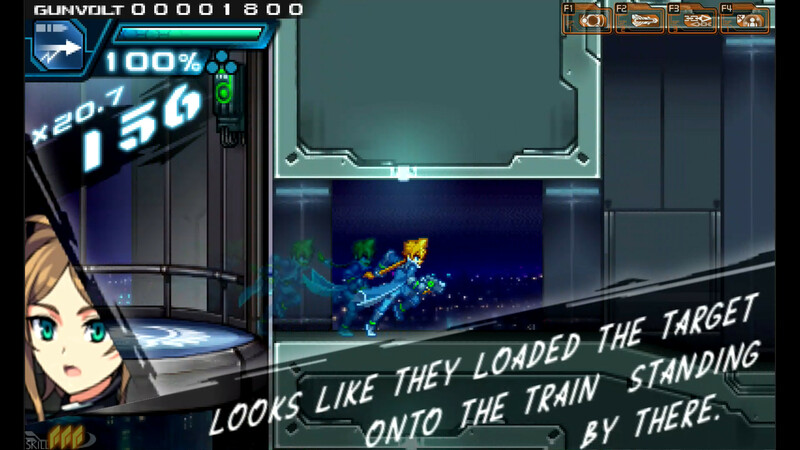 Now that you have a general idea of what’s going on in the world of Azure Striker Gunvolt 2, let’s take a moment to talk about Eden’s most powerful, well-known adepts known as “The Seven”. Inti Creates Will Be at Anime Expo 2016 With a Booth and Panels! That’s right, we’re going to Anime Expo for the first time ever, and we will have the biggest presence we have ever had at a show outside of Japan…ever! We will have a double-sized booth on the show floor, and by our powers combined with our Gal*Gun publishing partners at pQube, we will have even more awesome stuff at the show! Here’s a full breakdown of all the Inti Creates stuff you’ll find at Anime Expo 2016! We are extremely happy to announce that official Azure Striker Gunvolt merchandise is now available through our our friends at Fangamer! Fangamer is known throughout the gaming community for their high quality merch and impeccable customer service, and we are delighted to work with them to bring all BRAND NEW Gunvolt merchandise to you. Greetings, Strikers! 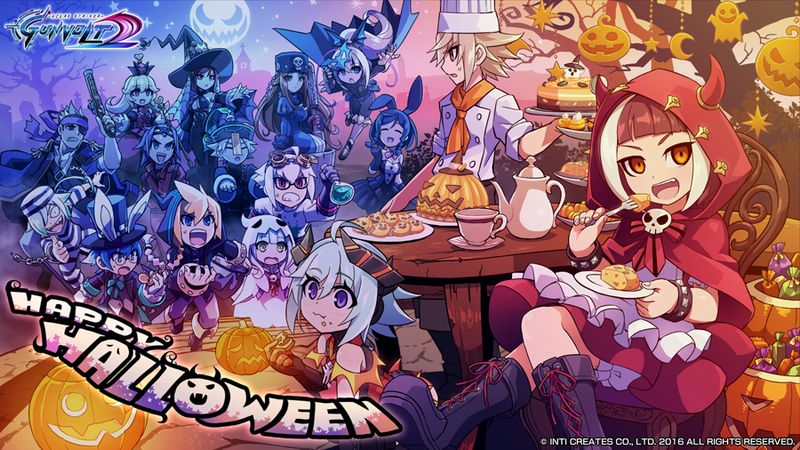 It’s been about a month since the last release we did where we introduced some of the characters in Azure Striker Gunvolt 2. Today, we are happy to introduce to you three brand new characters! Let’s meet Xiao Wu, Mytyl, and Nori! With the big announcement revealed yesterday in regards to Azure Striker Gunvolt 2 in Japan, I thought now would be as good a time as any to bring our wonderful fans outside of Japan up to speed on what’s going on with GV2.